The well-known ceiling of the Sistine Chapel was painted by Michelangelo in his younger years, between 1508 and 1512. The last judgement was done at a much later date: work started in 1536 and finished in 1541. On May 18, 1536, Michelangelo Buonarroti began purchasing the paint he needed for his evocation of The Last Judgment. 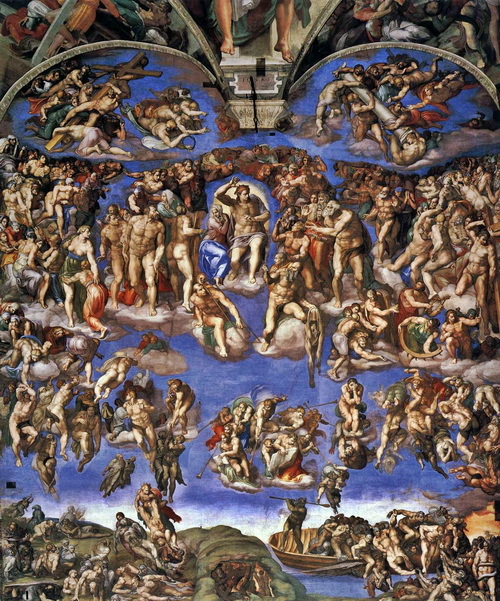 The assembled cast must represent everybody who has ever lived, the good, the bad, the famous and the obscure; the decision being taken by God must clearly be the most momentous of all decisions ever taken; the painter must convincingly imagine hell for those who receive the thumbs-down on God's final judgment; at the same time he must convincingly imagine heaven for those who are saved; then he must combine both in one composition; the sky must be filled with angels, some of whom are blowing trumpets to awaken the dead; the dead themselves must, of course, look alive, for they have been brought back to hear the final verdict; two large sections of crowd must be differentiated and orchestrated, those to be damned and those to be saved; with this much flying, pulling, struggling upwards, gazing downwards, to be painted, the foreshortening problems alone are momentous. Thus you have the busiest crowd painting imaginable representing the simplest of decisions: yes or no. Small wonder that so few have succeeded in turning this recipe for painterly chaos into a convincing and coherent work of art. Of course, painting the Sistine chapel was arduous, time-consuming and problematic. But it was also obviously engrossing, endlessly opportune and, sometimes, sheer fun. Among the colours Michelangelo began purchasing in the spring of 1536 was one which was only found in Afghanistan, ultramarine, a precious blue made of crushed lapis lazuli, the most expensive of all the Renaissance colours, more expensive than gold, usually reserved for the Virgin's cloak, or flashes of heavenly sky in paintings by Titian. As the restoration of The Last Judgment reveals, Michelangelo was probably the only painter ever to use ultramarine with true promiscuity and abandon; the Pope was paying. What we now see at the east wall of the Sistine chapel is an artist taking a precious material and splashing it about as if it were house paint. The result is an impressive acreage of blue sky that glows thrillingly, and effortlessly effects the difficult transition from real to divine space.